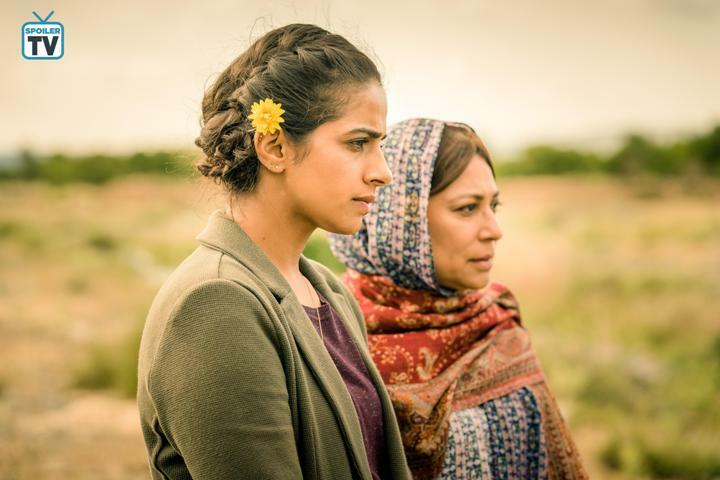 Doctor Who - Demons of the Punjab - Review: "Partition"
© BBC Pictures Episode: 11.06 "Demons of the Punjab"
This week Yasmin convinces the Doctor to let her travel back in time and meet a younger version of her grandmother Umbreen. 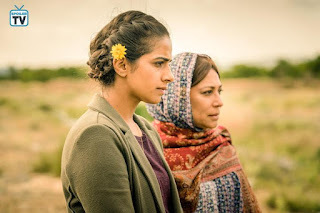 Against her better judgment the Doctor agrees and the group lands in Punjab, on August 14th, 1947, the day before the partition of India (into India and Pakistan), a very deadly and volatile time, known for violence, hostility and the loss of life in the divided countries. 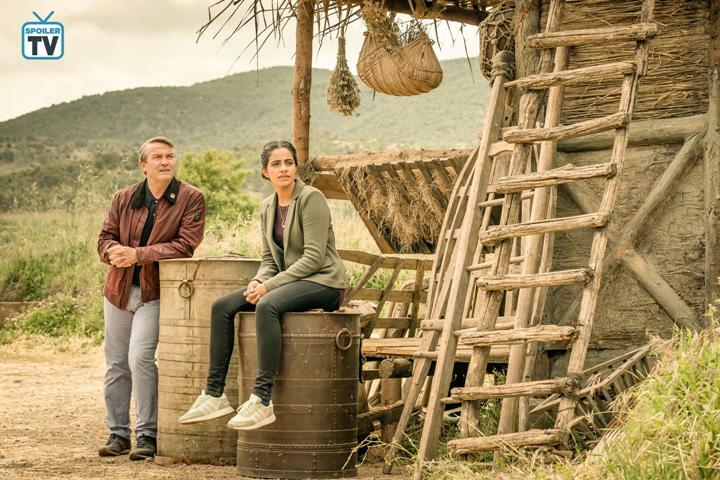 While Yaz tries to learn more about her family's hidden history and understand how her grandmother could be marrying a mysterious man who is not her grandfather and whose name was never even shared by Umbreen, the Doctor and her friends discover that there are demons in Punjab when a holy man is found murdered with two aliens standing over him. Eventually the Doctor identifies the aliens as Thijarians, a race of assassins who explain to her that they've changed after the destruction of their home planet and have become witnesses, standing by those who die alone and honoring them in their last moment. Thirteen also learns that Prem, Umbreen's fiancé will die on the day of their wedding and there's nothing that she could do to save him, unless she's willing to alter history and erase one of her friends from existence. 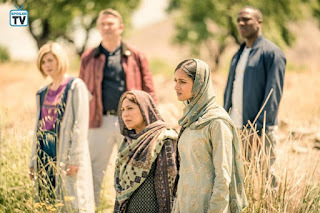 The Doctor and her friends decide to stay as long as they can and take part in the wedding ceremony of Umbreen and Prem, knowing what's going to happen next. When the time comes, Prem's younger brother Manish is revealed to be the murderer and brings with him a few armed men who are "checking the land for people who don't belong" and end up killing Prem who stayed behind to give his wife and her mother time to run away and find safety across the new border. 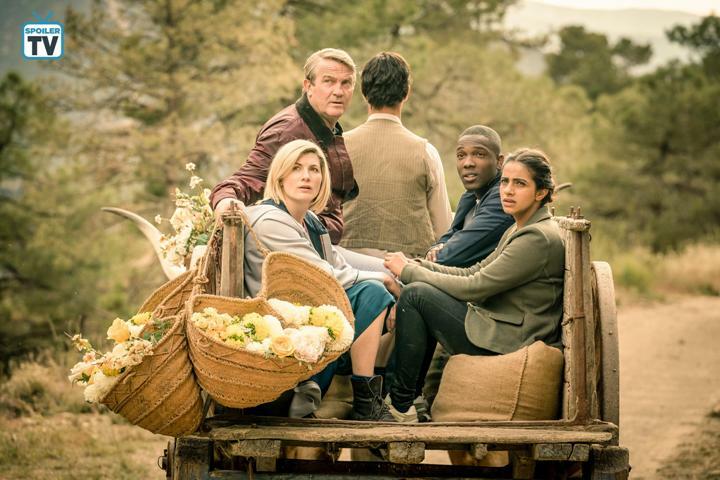 The Doctor and her companions leave the past without interference but with Yaz knowing so much more about her beloved grandmother's history. These are the stories that stay with me the longest. The personal and emotional ones. The ones where the true monsters, the demons of the week turn out to be ordinary people. In any supernatural, science fiction or fantasy series, these very often hit me the most. This was no exception. The moment when the Doctor (and the viewers) learn about the true intentions of the Thijarians it becomes clear that the source of the upcoming tragedy is much closer to home. In fact there's really no other characters we've met, other than Manish, that could be responsible for what's about to happen. The truth weighs heavily on the Doctor. It's yet another situation where she's forced to go against herself and stand back, allow things to take place in the same way they always did. We don't know if Prem's death is a fixed point in time but if he's alive it's clear that Yasmin would never be born and that's an event that can't be changed, not after everything she's been through with the Doctor. 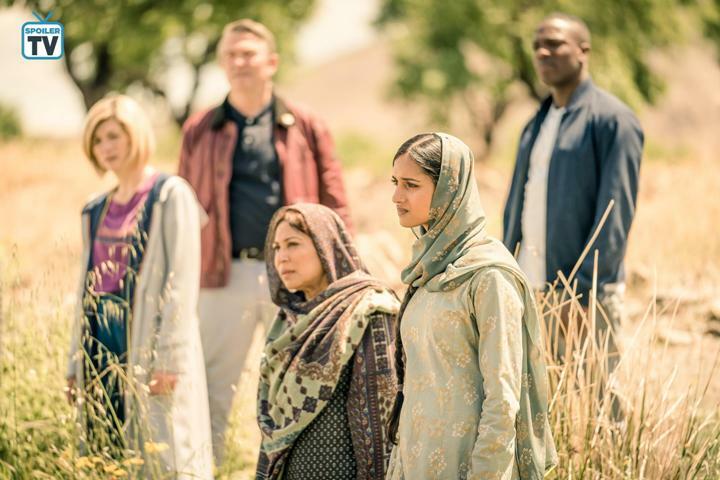 It's not the repetition of Rosa Parks' story but it's deeply connected on a more personal level and through the steps the Doctor and her friends have to follow once again. It's quite heartbreaking to watch, even harder to understand and the very worst part - the Partition of India is a part of our real history, all the deaths, the pain and destruction, they all really happened and not many people around the world know the truth about them. Which is why I'm grateful to Doctor Who for helping to shed light on the stories that so often are left untold, buried or forgotten. Telling the history impacting generations, but from the perspective of individuals, that's something the show is doing a fantastic job with this season. Certainly the most memorable hours and moments for me so far. Once again Yasmin and her family find themselves at the center of the story. I did love seeing her wonderful connection with her grandmother. Their scenes in both present and the past were beautifully done - personal and moving. She's definitely inspired by strong women like her Nan and the Doctor and strives to be the very best version of herself. We've barely begun to get to know her but it already feels like she's been through so many changes and developed into a powerful and memorable character. Such a great difference when I think back to the first episode of the season. I don't think the same can be said about Ryan. He's a supportive, kind and funny guy. He does seem to have a talent when it comes to getting people to open up a bit and trust the group. However we haven't really delved into who he is, what he's looking for in these adventures, what's his place on Team TARDIS even. I hope to see more of this character and learn more about his background, struggles with dyspraxia, maybe his relationship with his father and Graham, if only to truly feel like I know him a bit better. He's still quite a mystery for me, especially if compared to the rest of the group. I do love Graham's character. He has already become the moral compass of the team, always there to share his wisdom and offer helpful advice to those in needed. His reactions to the events also tend to be the most emotional and heartfelt. His goodbye to Prem, telling him he's a good man, not quite sure how to find the words but trying to comfort someone so close to death. He's also present by Yaz's side when she's struggling to understand her Nan's actions and hidden truths. He tells her just what she needs to hear, making sure that she doesn't waste this opportunity to see her grandmother in a new light and spend this extra time with the person she loves. And then there's the Doctor. One other person who does her best to protect and support everyone around, once again confronted with the painful realization that not everyone can be saved, no matter what she does. That shot of the Doctor closing her eyes after hearing the gunshot and walking away from it, such a powerful moment for Thirteen. After all this time, every loss still hurts her deeply. Of course she continues to be clever, funny and kind, she even ends up marrying Prem and Umbreen. Her speech about love and hope being able to survive everything was not only beautiful but says so much about Thirteen. The Doctor of Hope for sure. Though I'm still searching for something more familiar in Thirteen she truly does represent what Twelve was wishing for in his final speech and that's quite something already. The aliens of the week start the episode seemingly threatening and deadly. I appreciated the twist that these aliens didn't actually turn out to be another race visiting Earth to destroy it or harm its people. Instead, they embarked on the mission of kindness, dedicated to honoring life instead of ending it. Quite a beautiful sentiment and certainly a change from most of these type of stories. As in most cases, kudos to the crew of the show for the design and final result of these new aliens. I like how the creators are still able to come back with a new idea after so many years of viewers meeting all the different races in the universe. Now, for the overall season thoughts, it seems interesting there doesn't appear to be any ongoing season-long arc. I thought Stenza might be a common threat in multiple episodes and I still think they might be back, but all the hours so far are really standalones without any real developments for the Doctor's journey. 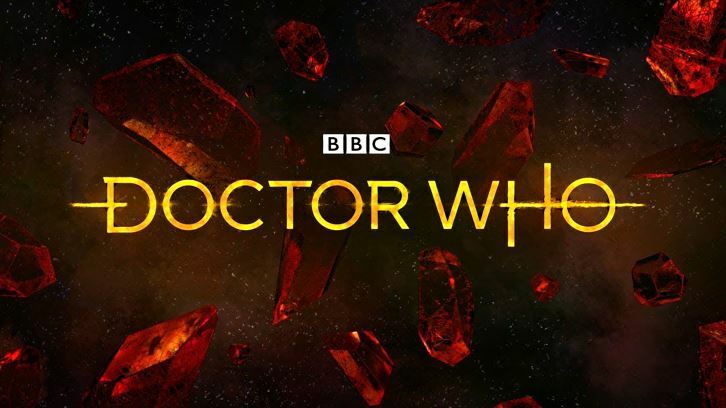 In fact, it does seem like all the episodes so far were mostly focused on developing the companions instead of making things personal for Thirteen. As someone who really enjoys seeing things connected and mysteries unfold, I do miss that element and I'm still hopeful there's more behind these events than we realize. If not, at least I can say I did like all the stories so far, especially "Rosa" and this latest hour. There's something about knowing the impact of these real life events and the horrible choices that the Doctor has to make in both of these, to preserve time and history, that truly makes them stand out from all the others. Maybe the biggest villains of the season actually turn out to be ordinary people? I'm very interested to see what's going to happen next and how this season will end. Can't believe we're already so close to the finale. 1. The episodes set during the historical events are the best ones for me this season. How about you? Are you missing the adventures in the distant future and discovering the new planets? Or do you appreciate the closer look at the real-life stories less known to the people all around the world? 2. I'm always grateful when the writers are given a chance to write a story more personal and more closer to their own experiences. There's such a meaningful depth about them, unlike anything based solely on one's imagination. How do you feel about mixing TV and real life stories? Do you prefer when the writer is closer to the discussed topic or would you rather have the story written from the outsider's perspective? Maybe a bit of both? 3. We've met Rosa Parks and travelled to the Partition of India. What other historical events would you like to see Doctor Who shed more light on? Anything from your own country? 4. Last but not least, I'm so glad we're travelling outside the UK and US this season, hope to see the episodes taking place all around the world. It's absolutely wonderful to experience the new culture and place through Doctor Who. 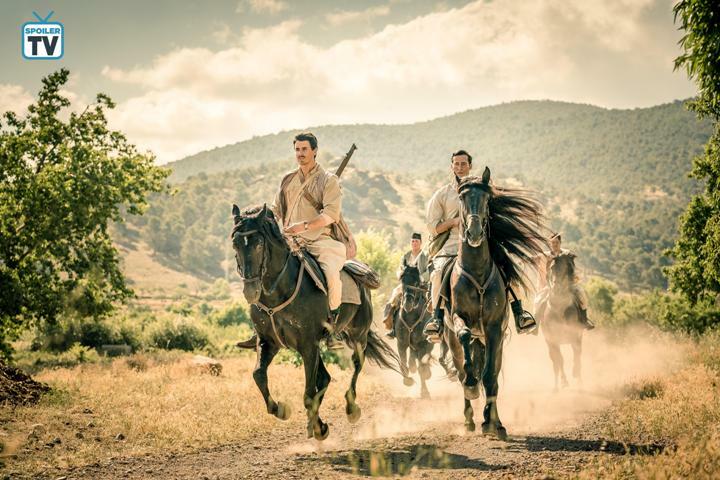 Clearly the history is happening everywhere at once, would love to see more stories set in Asia, Africa, Australia or other countries of Europe and Americas. How about you? 1. Thijarians: "This is all that remains of our home. Our people. Every ancestor. All one dust.... They died unwitnessed, unsaved. We were too late to grieve or honor them. But we, who returned, gave up 100 generations to sift, to remember the lost dead, the unmourned. In time, it was all we knew. And now we travel beyond, seeking the unacknowledged dead. Across all of time and space. This is now the Thijarian mission: to bear witness to those alone. To see. To bear pain, honor life as it passes." 2. The Doctor: "Love, in all its forms, is the most powerful weapon we have because love is a form of hope and, like hope, love abides in the face of everything." 3. Graham: "I honestly don't know whether any of us know the real truth of our own lives. 'Cause we're too busy living them from the inside." 4. Yaz: "What's the point of having a mate with a time machine, if you can't nip back and see your gran when she was younger?" 5. Prem: "Ordinary people whipped into a frenzy to be part of the mob. There’s nothing worse than when normal people lose their minds. We’ve lived together for decades – Hindu, Muslim, Sikh – and now we’re being told that our difference are more important than what unites us. It’s like we learned nothing in the war. I don’t know how we protect people when hatred’s coming from all sides." Graham: "Well, all we can strive to be is good men. And you, Prem, are a good man. " What did you think about "Demons of the Punjab"? Any favorite scenes, quotes or theories? Feel free to let us know in the comments. Check out the press release & promo for the next episode "Kerblam!". As always, thanks for reading!